Ottawa, the capital city of Canada (Washington, DC's Canuck equivalent) and home to Prime Minister Stephen Harper & many Francophones is known for our Parliament buildings, the Rideau Canal (aka the world's largest outdoor skating rink), the Ottawa Senators NHL team and the birthplace of Alanis Morissette. We recently built the largest Ikea in Canada and according to Wikipedia, Ottawa is one of the most educated Canadian cities! What we're not as well known for is being a fashionable city (Montreal & Toronto 'wear' that honour). But all that is changing with our increasingly popular Ottawa Fashion Week, the influx of style bloggers and unique local retailers. St. Laurent Centre, Ottawa's largest shopping mall is currently hosting a style contest. Participants take a photo of their fab outfit and post it to Instagram or tweet it using the hashtag #OTTSTYLE or simply upload it directly to St. Laurent Centre's Facebook page. Then it's up to the public to vote for their favourite ensemble and the lucky winner will receive an iphone5! The contest is now closed and you can vote for me over here! The winner will be announced on November 3rd. I LOVE peeptoes and tights, so cute! How fun! Hopefull you win, an Iphone would be awesome. Loving the peep toes and tights. So cute. Have a great weekend! oh no, not at all! no fashion here in my hometown :P most of the people wear only black and grey all year round and no, not fashionably. good luck for the competition, Emily! your bold and colourful outfit deserves the award! You look fantastic! I love the pop of color from the shoes and accessories with that awesome jacket!! I hope you win!! I live in a city famous for cherry orchards. And that is it. There is nothing like fashion here. But, that's okay because we have cherry orchards, damnit. I try to vote but it said voting starts tonight at 11:59. So I will vote tomorrow. Good Luck. Ok, i clicked like but voting starts at 11:59 so i will definitely go back doll. GOOD LUCK!!! Emily, you are just too cute! I hope you WIN! You should totes win - love this outfit! Very cute! I love all the different pops of colour you've added! Love the outfit, this is so fun! 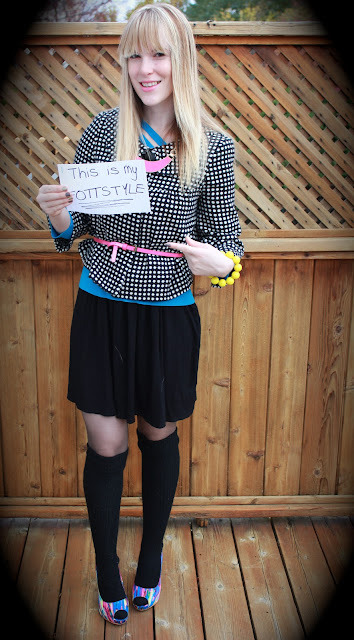 And I hate the stigma of ottawa being so "unfashionable" ... Glad it seems to be changing! goood luck!!! I love this outfit, Emily. I'll be rooting for you! With your over-the-knee socks and flirty skirt, you look like you should be on your way to a dance studio! This outfit shows off your legs really nicely. Thanks for helping put Ottawa on the fashion map!